What Is Singing Bowl and Sound Healing? Tibetan bowls are a type of bowl that vibrates and produces a rich, deep tone when played. Also known as singing bowls or Himalayan bowls, Tibetan singing bowls are said to promote relaxation and offer powerful healing properties for the mind and body. Buddhist monks have long used Tibetan singing bowls in meditation practice. In addition, some wellness practitioners (including music therapists, massage therapists, and yoga therapists) use Tibetan singing bowls during healing treatments. and when working to realign and balance the chakra system, a subtle energy system that many traditions have turned to for balancing Prana and moving towards self-realization. People use Tibetan singing bowls for many purposes, including stress reduction and pain relief. Some people use the bowls in combination with other healing practices, such as meditation and deep breathing. 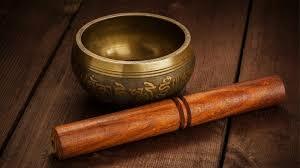 Tibetan singing bowls can stimulate the immune system and produce beneficial changes in brain waves. The Benefits of Tibetan Singing Bowls vary and scientific studies have examined the potential benefits of Tibetan singing bowls, in addition to their long history of use. One of the available studies is a report from the Swiss journal Research in Complementary Medicine. For the study, 54 people with chronic pain originating from the spine were assigned to either six sessions of singing bowl therapy, a placebo treatment, or no treatment at all. Study results showed that members of the singing bowl group and the placebo group experienced a significant decrease in pain intensity. The study's authors also found that both the singing bowl therapy and the placebo therapy had a stress-reducing effect on participants. Promotes stillness, happiness and well being and Stimulate the immune system. ​Tibetan/Himalayan Singing Healing Bowl Sessions are priced based on a sliding scale starting at $45 for a an hour session and increasing to $55-$108 for an hour or 90 minutes, depending on your personal needs. Are Singing Healing Bowls right for you?